Some of the key growth drivers of the global LED services market are need for energy efficient and cost effective lighting solutions that are suitable for a range of application segments. Integration of LED lighting with wireless communication technology and availability of IoT-enabled LED lighting is offering a whole new experience to consumers than what was offered by traditional ones. As per a report by Transparency Market Research, the global LED services market is likely to expand at a CAGR of 10.6% between 2017 and 2025 for the market to reach a valuation of US$22.42 bn by 2025 increasing from US$9.26 bn in 2016. The application segments into which the global LED services market is segmented in this report are residential, public lighting, and business lighting. The segment of public lighting is further segmented into smart lighting and street lighting. Smart lighting includes video-surveillance, intelligent crosswalks, intelligent traffic lights, electric vehicles charging stations, and traffic monitoring. In 2016, residential lighting accounted for the leading share of almost 45% in the global LED services market. Rising at a promising growth rate, the segment is expected to hold on to its lead position over the forecast period. This is mainly because of increasing demand for smart lighting solutions for residential spaces that provides higher luminosity. The public lighting application of the LED service market is predicted to surpass the growth rate of other applications over the forecast period. Commencement of large scale street lighting projects and development of smart cities in many parts of the world will benefit the public lighting application segment in the forthcoming years. Energy efficient lighting which is an important requirement of smart city projects benefits from the offerings of LED lighting solutions. Hence, LED lighting solutions and services play an important role in smart city projects. Street lighting segment within public lighting is expected to display promising growth rate over the forecast period due to favorable regulations for LED lighting systems and need for energy efficient and cost effective solutions. Ongoing and infrastructure developmental projects in the future are expected to present immense growth opportunities to this segment of the market. Business lighting which includes commercial office space and retail segments is expected to generate significant revenue in the forthcoming years due to increasing installation of LED lighting systems in offices, shopping malls, and restaurants. The global LED services market is segmented into five key regional segments, namely North America, Asia Pacific, Europe, South America, and the Middle East and Africa. Europe stood as the leading regional market amongst all in 2016. Infrastructure development, changing government policies and regulations, long term contracts, and focus on energy efficient lighting solutions are the key factors behind the supremacy of the region. North America stood as the second-leading market for LED services in 2016 revenue-wise. Favorable government regulations for switching to energy efficient lighting and developed infrastructure are leading to increased adoption of LED solutions in the region. Asia Pacific, powered by China and India is anticipated to emerge as a significant market for LED services over the forecast period. Some key players in the global LED services market are Thorlux Lighting, LEDVANCE GmbH, Philips Lighting, OPPLE Lighting Co. Ltd., Reggiani Spa Illuminazione, Bright Special Lighting S.A., Endo Lighting Corp., Global Light LLC, KKDC Co. Ltd., and Cree Inc. The report on global LED services market provides analysis for the period of 2015 to 2025, wherein 2016 is the base year and the 2017 to 2025 would be the forecast period. Data for 2015 has been included as historical information. 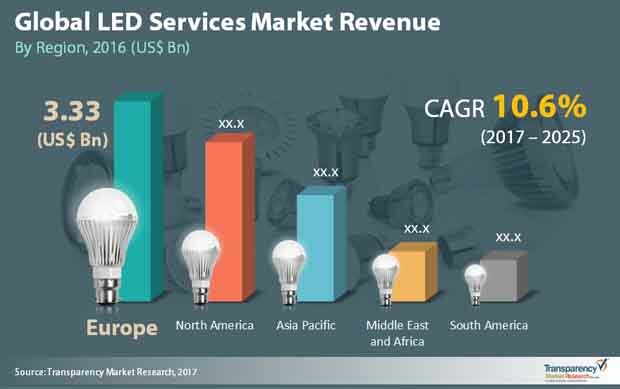 The report covers all the prevalent trends and LED projects playing a major role in the growth of the LED service market over the forecast period from 2017 to 2025. It also highlights the various drivers, restraints, and opportunities expected to influence the market’s growth during the forecast period. The study provides a holistic perspective on market growth throughout the forecast period in terms of revenue estimates (in US$ Mn) across different geographies, which are North America, Europe, Asia Pacific (APAC), Middle East & Africa (MEA), and South America (SA). The report also provides market attractiveness analysis for all the segments for all the geographies in the scope of study which identifies and compares segment’s market attractiveness on the basis of CAGR and market share index. The report also includes key industry developments that have taken place in the global LED services market over the past years. Porter’s Five Forces analysis is also included in the report for analyzing various factors affecting market growth. LED services market includes lighting services such as installation/design/maintenance/others provided by commercial electrical/lighting contractors and integrated solution providers. The report scope considers revenue estimates for earnings from sale of lighting projects (installation/design/maintenance/others) by such vendors. The study also excludes consideration of retrofitting revenue and LED module revenue from its scope. The demand for LED lighting is increasing significantly across various application segments. Rising adoption within the public lighting application segment is one of the primary growth drivers for the LED Services Market. Furthermore, increasing environmental awareness, need of energy efficient lighting, and favorable government regulations is also anticipated to fuel demand for the LED lighting products during the forecast period. The research report provides in-depth analysis of the global LED service market on the basis of applications. The LED services market is segmented on the basis of application into Residential (Home), Public Lighting (outdoor), Business Lighting (Indoor). The Public Lighting (Outdoor) is further divided into smart lighting and street lighting whereas Business Lighting (Indoor) is further segmented into government and private. In terms of geographical regions, the report segments the LED services market into North America, Europe, Asia Pacific, Middle East & Africa (MEA), and South America. Country level analysis (for major countries) is also provided for all these regions. All the regions and countries are analyzed in terms of revenue generation. The report provides cross-sectional analysis of the global LED services market in terms of market estimates and forecasts for all segments across different geographic regions and countries. The countries included into the report are North America – the U.S., Canada; Europe – the U.K., Germany, France, Spain, Romania, Italy; Asia Pacific – China, Japan, India, Indonesia; Middle East & Africa (MEA) – UAE, Saudi Arabia, South Africa; South America – Brazil, Argentina, Chile, Colombia, Peru. The report also includes competitive profiling of major players engaged in device manufacturing and service offerings for LED. The major business strategies adopted by these players, their market positioning, and business overview have also been identified in the research report. The report also provides competition landscape which include competition matrix, market share analysis of major players in the LED services into leading players, prominent players and emerging players. Competition matrix section benchmarks leading players on the basis of their capabilities and potential to grow. Factors including market position, offerings and R&D focus are attributed to company’s capabilities. Factors including top line growth, market share, segment growth, infrastructure facilities and future outlook are attributed to company’s potential to grow. Some of the major players profiled in the report include Thorlux Lighting, LEDVANCE GmbH, Philips Lighting, OPPLE Lighting Co., Ltd, Reggiani Spa Illuminazione, Bright Special Lighting S.A., Endo Lighting Corp., Global Light LLC., KKDC Co., Ltd. and Cree Inc.